If you cut asphalt, concrete, aggregate,granite, bridge pile, iron pipe, ceramic, porcelain, or other hard material with a diamond saw blade or if you grind and polish concrete, you know the call. The caller is from a company you’ve never heard of offering a sweet deal on diamond saw blades. “They’re just like the ones from World Diamond Source,” or so the well practiced spiel goes. Veteran diamond blade users know better. It’s just another no-name,pop-up company peddling junk blades. So where does a smart blade buyer go for proven quality, consistency, and savings ? 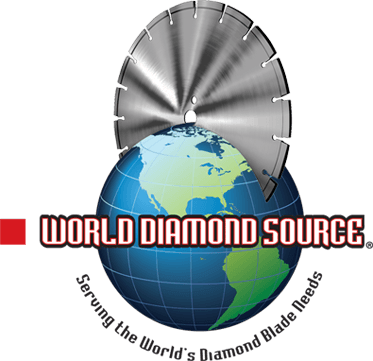 There’s only one source, the Source … World Diamond Source. Here’s what World Diamond Source founder, owner, and president, Clifford (Cliff) Mad dock, says to the contractor looking for a reliable diamond blade supplier. Some say World Diamond Source is like the North Star in today’s diamond saw blade market. What do you say to that? It’s a great compliment. We’re a family owned and operated business and we work hard to win the trust and business of our customers. It’s no secret the marketplace is warming with no-name companies offering up “deals” on cheap blades. I don’t blame some contractors for falling for the pitch.When I started the company nearly 20 years ago, I swore we’d stick to a simple game plan: Offer top diamond blades at a fair price and then back it with second-to-none service. A lot has changed in those 20 years. But one thing hasn’t for our customers.They depend on us to deliver the best dollar per cut value in the industry, backed with terrific support, before and after the sale. How do you tell a good diamond blade from a bad one? Good question. Even I can’t tell the difference just by looking. That’s why we make it easy and even a little fun by inviting contractors to put our blade to the test entirely at our risk and expense for 30 days. If it kicks you-know-what like I know it will, nine out of 10 contractors will happily pay for it. After all, they’ve just seen a blade of immense value in action.Like we say, is it better to buy 10 $100 tools or just three $250 tools to perform the same job? It’s a challenge that’s tough to say “no” to. Why is World Diamond Source seen as an innovation leader? It’s because we move faster than anyone else out there to advance the state of the art. Take vacuum brazed diamond blades. I won’t get into the technology here, but it’s a powerful way to cut most anything, rebar, bare metal,ductile iron, you name it. We were the front runners in carrying it. Now every one else is tugging at our coattails over it. We’re tremendously nimble and we move lightning fast to jump on innovation and then back it with one of the industry’s largest inventories of product. No one compares. What do you recommend for next steps? Visit our website at worlddiamondsource.com. You’ll find great resources along with easy online ordering or a downloadable catalog. Customers like factory-direct pricing backed with outstanding customer service.